Loyal to the object of tourism and having as a standard Greek hospitality we created Hotel “SELINI” for your best accommodation. The hotel was erected in the year 1992 and in 2004 has realised a full renovation to the facilities. Hotel “SELINI” is the best choice for your accommodation because it provides you with modern conveniences and is at a distance of 70m only from the sea. 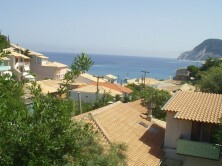 Visit beautiful Lefkada. We wait for you to show you our hospitality. Operating period: 1/6 – 30/9 every year. Our rooms are comfortable and decorated with taste in a simple way. Our hotel “SELINI” has totally 12 rooms, 7 double rooms and 5 triple rooms. All the rooms are equipped with private bathroom, air condition, TV, fridge whereas one of the rooms (double room) has cooker as to prepare (if you desire) your meals. The rooms are tidy regularly. There is free Wi-Fi internet connection available for our guests. Our hotel has, also, private parking for the visitors’ cars. The friendly atmosphere and the service that is provided are the characteristics that will make your holiday pleasant. In the region you will find many taverns, bars and cafes for your entertainment as well as super market.